RIO DE JANEIRO, BRAZIL – Ipanema rose to international fame thanks to Antonio Carlos Jobim and Vinícius de Moraes and their 1960’s bossa nova hit ‘Garota de Ipanema’ (The Girl from Ipanema). Those lucky enough to live in the Zona Sul (South Zone) neighborhood enjoy easy access to the best that Rio has to offer, including a beach that the Travel Channel claims to be one of the sexiest in the world. 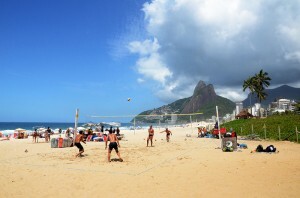 There is always a game going on at Ipanema beach, photo by Alexandre Macieira/Riotur. The active beach-goers can find a range of activities including beach volleyball, footvolley (a local invention that combines elements of volleyball and soccer), surfing and stand-up paddleboarding, while those who are looking for a more relaxing time can pass the day lounging in the sun, enjoying ice-cold beer or coconut water supplied by the numerous beach-side vendors. Either way, there is never a shortage of interesting people-watching, as Ipanema beach is known as the most beautiful beach of Rio and can get packed on a sunny weekend, especially when the beach-side road is closed off on Sunday. Besides the beach and a variety of dining and nightlife options, Ipanema boasts enough shopping options to satisfy any shopaholic, ranging from luxury brands Louis Vuitton, the more mainstream commercial street Visconde de Pirajá, to the popular “Hippie Fair” that takes place every Sunday on Praça General Osório, where shoppers can find a variety of local, artisan products. The neighborhood also offers many international restaurants, such as Japanese Nik Sushi, Mexican Azteka and American diner-style Gringo Café. The convenience of the neighborhood combined with the allure of the beach makes Ipanema one of the most desired residential locations in the city. 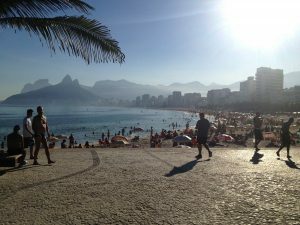 Ipanema Beach is a popular destination for both tourists and locals alike, photo by Kristen Nozell. Real estate in Ipanema is some of the most expensive in all of Rio (and all of Brazil), nestled between the exclusive Leblon and Copacabana. The high prices are driven in large part by the limited space; at just nine by seven city blocks, bordered by the Lagoa on one side and the beach on the other, there simply aren’t enough apartments to meet the demand. After a period of staggering growth, this year has seen purchase prices increase slower, with the cost of R$12,789 per square meter reported in July, an increase of 3.1 percent over the past twelve months. Since January of this year, the average purchase price has increased by 2.1 percent starting from R$12,457 per square meter. Apartment rentals reached their highest in June this year, even surpassing neighboring Leblon’s exorbitant prices, at R$68 per square meter, and only decreasing to R$67 in July. The lowest reported rental prices of 2013 occurred in April, when the average price hit R$65 per square meter. However, there is light at the end of the tunnel for renters, as recent data from the Fipe-Zap index showed that average Rio rental prices in general dropped 0.7 percent in August, the first decline since June 2010.